The friendship of a neighborhood veterinarian heavily influenced a young Allen Dunbar to devote his life to reducing the pain and increasing the life span of family pets. 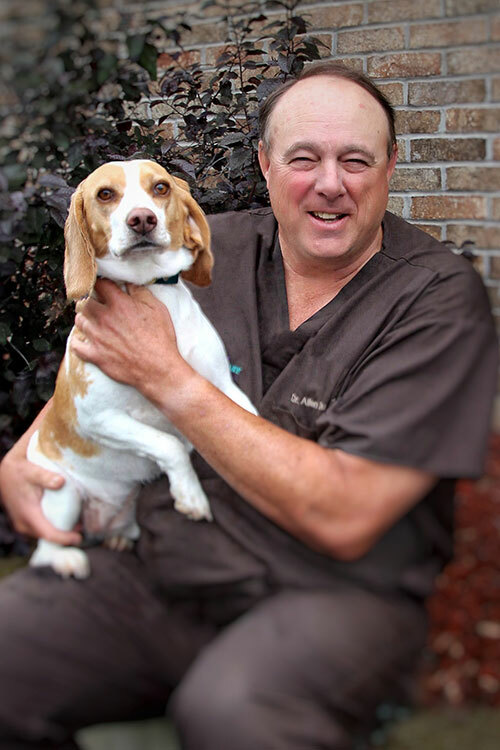 Since graduating from Veterinary School at Michigan State University with highest honors in 1977, Dr. Dunbar has consistently sought and treated pets facing challenging problems and requiring accurate diagnosis. As important, Dr. Dunbar's, extensive advanced training in orthopedic care makes him uniquely qualified to treat conditions that require advanced surgical procedures. "Being able to quickly determine what is causing a pet's problem limits the amount of pain the animal must endure." Dr. Dunbar states. "In addition, solving problems quickly limits the family's overall costs." Dr. Dunbar also brings to the practice expertise in Canine Sports Medicine with an emphasis on Sporting and Hunting Dog Performance. Through a disciplined regimen of Nutrition, Exercise, Conditioning and Training, Dr. Dunbar assists animals to compete at their highest capabilities. 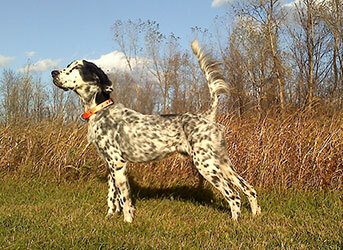 Dr. Dunbar raises and competes with English Setters in field trials. In addition to winning locally, several of his dogs have won championships and national event titles across the country. 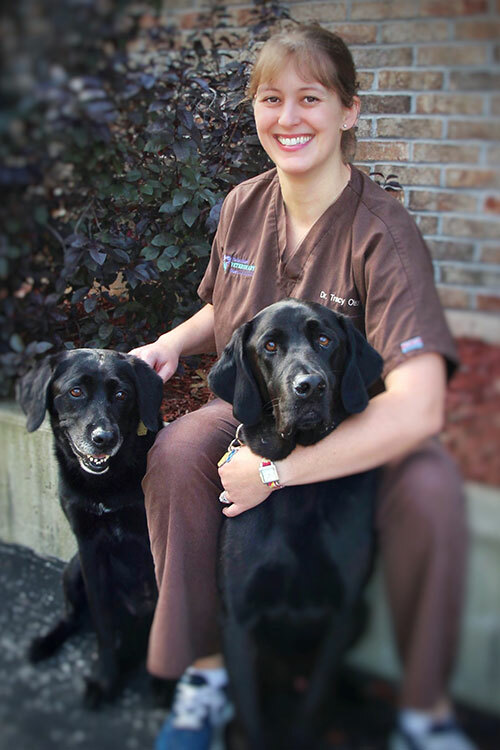 Dr. Rosen joined the Packerland team in July 2007 and enjoys the variety of practicing small animal medicine. Growing up, her life-long dream was to become a veterinarian and her passion for animals led Dr. Rosen to graduate from the UW-Madison Veterinary School in 2006. She worked in the Oncology Department at the Veterinary Teaching Hospital after classes and during summers administering chemotherapy and helping to strengthen the bond between clients and their beloved pets. She is dedicated to providing great care for animals in their time of need. Dr. Rosen and her husband, Greg, are very busy at home with their twins, Addison and Carter. The family includes two rescue pups, Lacy and Reese, who are always getting into trouble and keeping them on their toes!In her free time Dr. Rosen loves crafting, spending time with family and friends, and traveling. Dr. Olson is a life-long Wisconsinite and dreamed for years of moving to Titletown. She graduated from UW-Madison's Veterinary School in 2007 and moved away to complete a small animal internship at Carolina Veterinary Specialists in Greensboro, North Carolina. This experience provided additional training in emergency and internal medicine, surgery, ophthalmology, neurology and radiology. As a life-long animal lover and Packer fan, joining the Packerland team in 2008 was a dream come true for Dr. Olson. In her free time, she enjoys visiting with family, reading, and rooting for all the Wisconsin sports teams (when she has free time, that is). 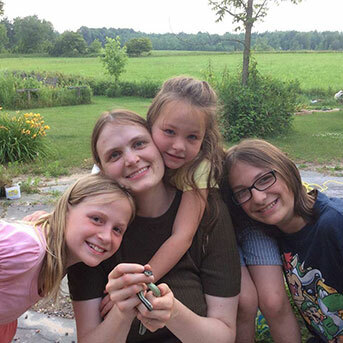 Outside of work she and her husband Bill are the busy parents to their 3 children, Ben, Nathan, and Emily. They also have two cats- Cheetoh and Xander, and two dogs- Cricket and Dexter, who are both black Labrador Retrievers. There is never a dull moment at home with that crew running around! 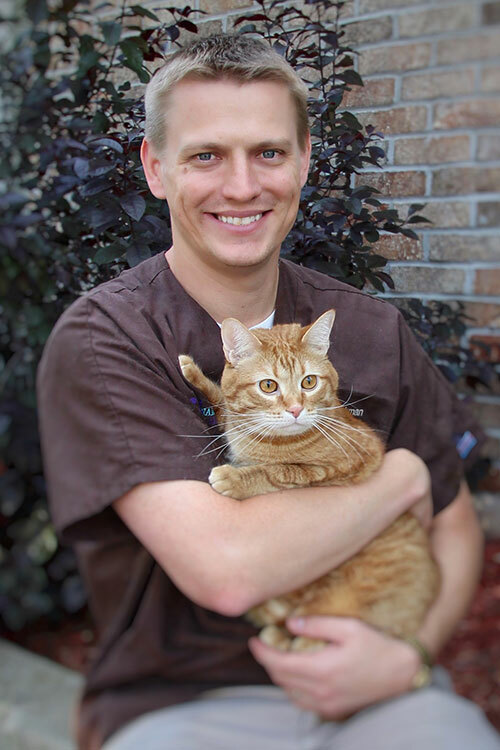 Having grown up in Green Bay, Dr. Broekman is thrilled to have re-joined the staff at Packerland, this time as a veterinarian! In 2008 he worked at PVC as a veterinary assistant and had the privilege of the learning the tricks of the trade prior to entering Vet School. In 2009, Brian started his veterinary education at Ross University in the Caribbean. After a year of intense studying and beach volleyball, he transferred to Illinois and graduated from the University of Illinois Vet School in 2013. 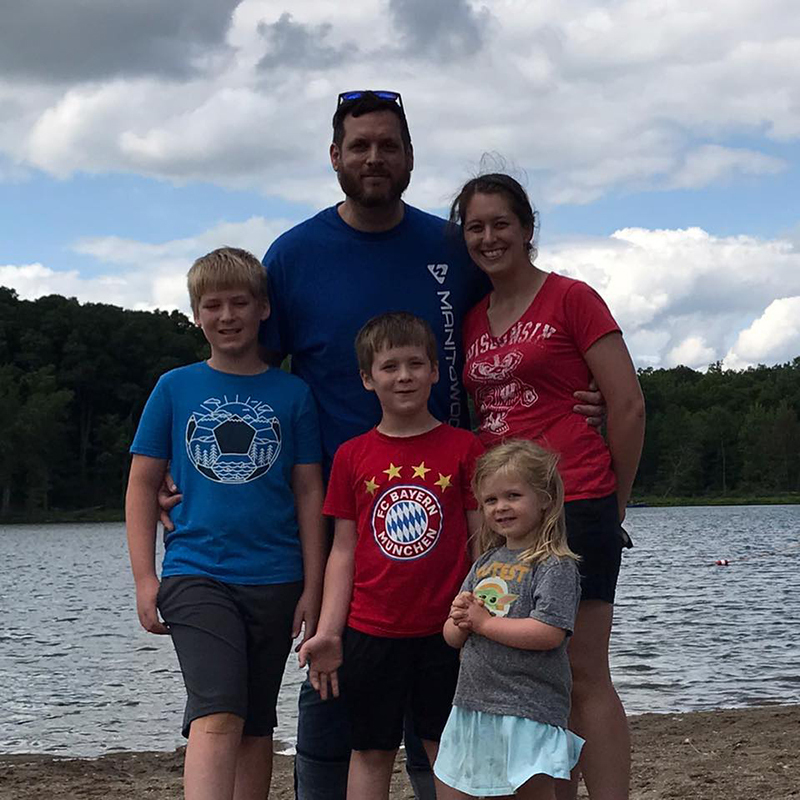 He is excited to return to PVC and Green Bay to serve the community and surrounding areas, with particular interest in the areas of small animal preventative care and ultrasound. In 2013 Brian married Catlyn, a dedicated supporter of his life-long dream of becoming a veterinarian and later that year they rescued a little orange kitten, Max. In his free time he likes to spend time with family, go fishing and hunting, cheer on the Packers and visit with friends. 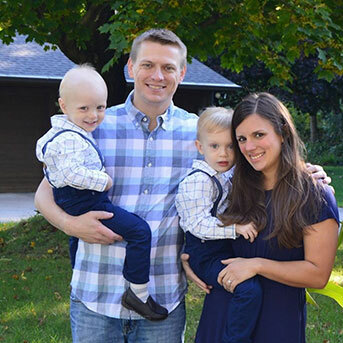 Dr. Broekman and his wife are the proud parents to two boys, Walter and Alexander, who are keeping them very busy! 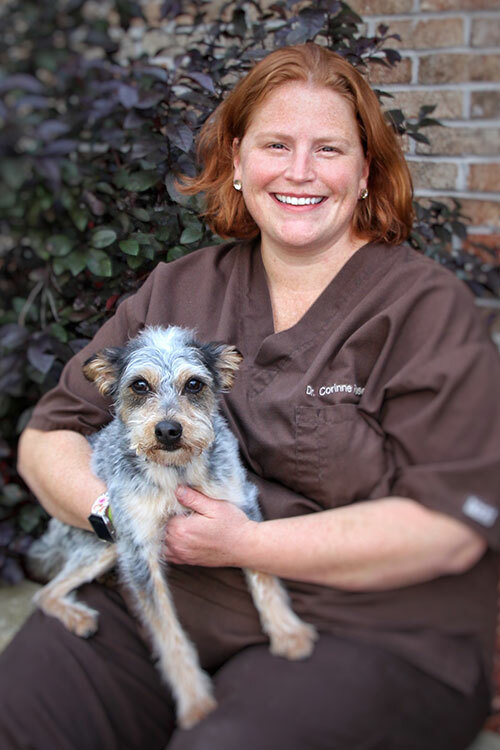 Dr. Geaudry is a general practitioner at Packerland Veterinary Center, but especially enjoys spending her time performing dental procedures and acupuncture. Dr. Geaudry grew up in Kimberly, Wisconsin. She attended undergraduate school at the University of WI – River Falls and then earned her veterinary degree at the University of Minnesota in 2002. 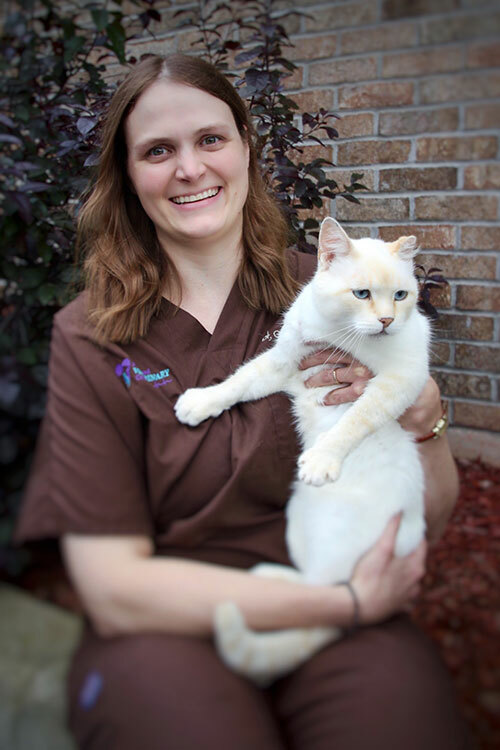 Dr. Geaudry practiced in Montana for 11 years, where she had the opportunity to work with wildlife and numerous domesticated exotic species and expanded her veterinary knowledge with extensive hours in emergency care. 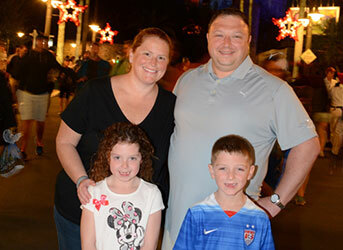 Dr. Geaudry and her family decided to move back home in 2013 and she has been practicing here at Packerland since. In 2015, Dr. Geaudry completed the intensive Acupuncture program through CuraCore in Colorado to earn her certification in Veterinary Medical Acupuncture. Dr. Geaudry lives on a small farm in Greenleaf with her husband, son, two daughters, puggle, cat and numerous chickens.